Called a “solar put,” kWh Analytics designed the new product to take uncertainty out of solar project investment. KWh Analytics unveils the first deal for its new solar project insurance product. A new insurance product from kWh Analytics guarantees up to 95 percent of forecasted energy production for a solar plant, providing security for solar developers in a regulatory environment where it’s been scarce. The “solar revenue put” offers backing for a project that makes lending debt less risky for banks. Using its solar asset database, kWh Analytics assesses performance for a given project, setting expected output and putting a price on the risk. If a solar farm doesn’t reach that agreed-upon output, the insurer pays for the difference. "This product pays for itself because you're able to unlock so much more debt and get the banks so much more comfortable with these assets," said Richard Matsui, CEO and founder of kWh Analytics. "It allows the banks to feel good and come through." With the new partnership, global insurer Swiss RE Corporate Solutions will keep risk from the projects on its own balance sheet. With that backing, projects will be able to get more debt financing at lower costs. KWh Analytics said the product will offset 50 percent of the $0.10 per watt cost of recently announced solar import tariffs. The company recently sold its first policies, covering about 40 megawatts at three Virginia solar farms owned by Coronal Energy. 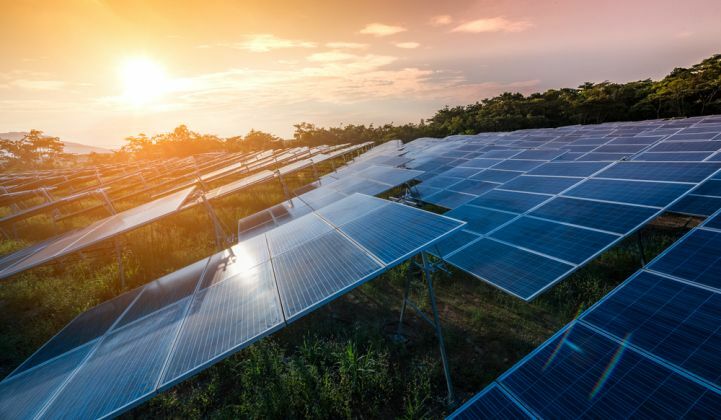 Cory Honeyman, associate director of solar at GTM Research, said the product should give developers more flexibility and assurance in a project’s viability. “Being able to raise more debt with a lower debt service coverage ratio means more breathing room for asset owners to hit their required returns during the term of a PPA, rather than being overly reliant on post-contract revenue stream,” said Honeyman. Matsui told Bloomberg the tool allows project developers an increase of debt between 10 and 15 percent. Honeyman said the mechanism will be “an important financial innovation” to continue lowering the cost of capital for utility-scale solar projects as power-purchase agreement prices continue to decline. The product could be especially helpful for project owners raising debt on a project-by-project basis rather than on the balance sheet, because Honeyman said that strategy relies more on project cash flows to meet the requirements of lenders. Driving down solar costs amid an uncertain, and even negative, policy environment has become increasingly important as the solar industry moves toward maturity. According to S&P Global, coping with tariffs announced by the Trump administration and other potentially harmful policy developments has essentially pushed the market back a year. GTM Research's own forecasts indicate tariffs could curtail U.S. installations by 11 percent through 2020. Innovative solutions and new financing tools can help alleviate some pressure on developers to keep moving forward. “With corporate tax reform potentially putting pressure on sponsor returns, and the tariffs adding another 5 to 10 cents per watt to all-in costs depending on the year, the ability for asset owners to increase leverage means they can eke out slightly higher returns via less required equity and a lower overall cost of capital,” said Honeyman. Guaranteeing generation could also give solar an edge over other clean energy resources. GTM Research solar analyst Rishab Shrestha, who previously worked at MAKE Consulting, said that it’s more difficult to offer such assurances for generation in the wind market. Looking ahead, the ability to predict generation with high accuracy could guarantee higher revenues for solar in addition to lowering project costs. Making Sense of Ultra-Low Solar Bids: How Low Can Tendered Prices Go?